When I first heard the thing from Shihab, it instantly came to my mind that this is some event that must not be missed. 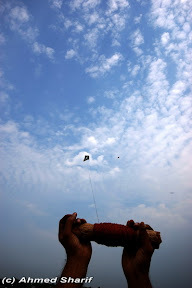 Last time the Ghuri Utshob (Kite Festival) was at St. Martin’s Island. Missed it and was really unhappy about it. This times things would be different. But I had plans for the same day! Would it be the same story once again? The registration had to be completed within Tuesday (18th March). And I was still undone when 18th passed by. Called up Shihab. He was delighted and he made arrangements for three of us: me, my other half and Riad, my little brother-in-law. It clicked in my mind that other friends of mine might go too. Called up a few others and got very positive replies. Now there was the problem; can we take as many as we want? There may be some limitations regarding logistics. I had to be sure. I decided to contact the organizers on the morning of the 19th. Incitaa Tourism, the organizers, assured me that I could still register several people, provided that pay them by late afternoon. The event belongs to Chobir Hat community. Incitaa does the organizing for the whole show. When I went to Incitaa office with Shihab and Farhan, I discovered that we were quite a few going together. In fact, we would be 18 people. Hasan Jaiedi Bhai of Incitaa wondered at our large contingent and joked that we would require a whole bus! Anyway, we learned about other activities of Incitaa and got fascinated. I knew of the Shurjo Utshob (Sun Festival), but didn’t know that its organizers were Incitaa. Incitaa also organizes numerous trekking activities with the help of North Alpine Trekking Club of Bangladesh. We came out of the office assured and happy, and with a lot of hopes. The starting time would be 10:00AM on 21st March (Friday) from Chobir Hat near Charukola (Dhaka University Department of Fine Arts). By 10:00AM on 21st March everything was ready. There were two buses. Headcounts started. We captured half of one bus. But there were problems with seating arrangements. We later learned from Jaiedi Bhai that a lot of people came in too late, who could not be rejected, but who also were outside formal arrangements. This created a bit of congestion, which didn’t go unnoticed. There were people on the roof. 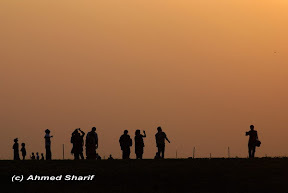 Though it looked like those people were trying to get a better view of the surrounding sceneries, that wasn’t in fact the cause behind their roof-travel. We started by around quarter past ten. Our destination was the great River Padma. Actually the river wasn’t the actual destination, it was an island in the river which would be the place of our festival. The place is in Lohajang Thana of Munshiganj District. We heard that it would be only around an hour’s traveling time. We even heard that some people work in Dhaka City coming from this place. Not a lot of distance actually. It was a Friday, a holiday; so, we expected the roads to be free. A buffer time for leaving the city congestion was not needed. We were driving south, leaving the City of Dhaka, crossing the 2nd Bridge across the Buriganga River. Before long our road was tearing through the green carpet of paddy fields. The weather was warm. Children were jumping in the cool water, leaving us feeling virtually stranded! We could do nothing other than watch and smile. I was envying the people on top of the bus, because they were supposed to get the best view. But before I could even start envying, our bus was stopped by a traffic surgeon. A brutal debate ensured. Some voices from inside the bus overwhelmed the lone traffic police. At last the people on top of the bus had to give in. The bus started again; and after a while, stopped again! We left the traffic police way back. The roof was filled up once again! There we go again. After some traveling we were crossing the two bridges across the River Dhaleswari. We knew we were near. We were on the road for more than one hour now. On the way we took a turn towards the right and drove for the bank of the Padma in Lohajang Thana. The journey took around an hour and 20 minutes. 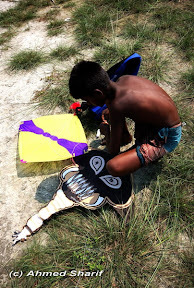 When we reached the bank of the Padma, we could already see some kites flying across the water. The island was separated from the shore by a narrow tributary of the Padma. Some people even called it a canal. I thought it was a little bit more than a canal. Anyway, there was a small motor boat ferrying our group across the water. We waited for our turn; some took their time with some refreshments. This shore was some sort of a trading point for wood. The wood reminded me of my last tour to Lawachara National Park. How many trees were felled to make this amount of wood? My heart sank by the sight of them. Could do well to leave this place for a brighter side of life on the other bank. Didn’t have to wait too long before our turn came up. The journey by boat was too short to write anything about it. before we could realize we were on water, we were jumping out of the boat! The island isn’t a small one. Couldn’t see any of the other three shores of the isle. 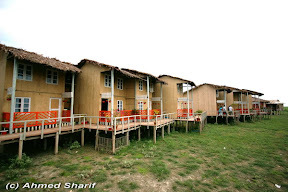 There was a small wooden resort on the island, called Padma Resort. As far as I could remember, we were told that we would be 20 minutes’ walking distance from the resort. But we were not too unhappy finding that the festival was actually just outside the resort. Incitaa didn’t have any tie-up with Padma Resort, but we could take services from them if we liked. And the moment we reached the other bank, we started thinking about a hiring cottage for us. It was very warm day and there was no other shelter in sight. 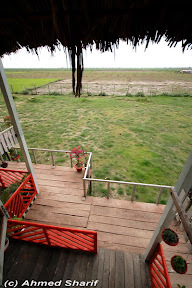 So, we hired a cottage for a bargain price of Taka 2,000. And when this amount was to be shared by 18 people, it was more than enough of a bargain. We took our time to freshen up. The kites were already in the air. We were in for a show. It felt almost like we went to our childhood. The kites brought back all the memories. 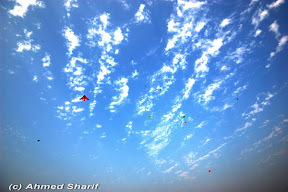 Before long, the sky was filled up with kites of many colours and shapes. It was a sight to see. The lizard was way ahead of everyone. It bought a place in the sky and never came back. 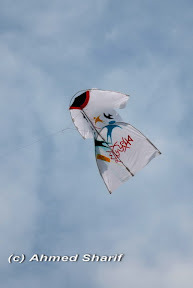 The wind was very good and was enough to support even the most stubborn of kites. 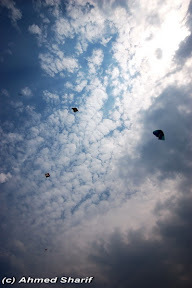 One by one kites began to fly and also began to compete with each other for height and space. Medusa was the brainchild of Jaiedi Bhai. It was one of the most graceful of the lot. 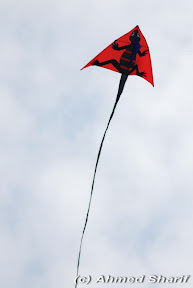 We took control of a black-and-white kite; not the prettiest, but stout and aerodynamic. It took off without any trouble and stayed up there. 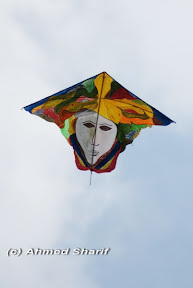 We also took control of a sun-shaped kite. The design was good enough for a long flight up there, but a small weight problem continuously pulled it on the right. It needed some careful flying. It came back several times and also took off several times. 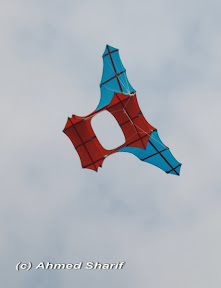 Some kites were really unique. 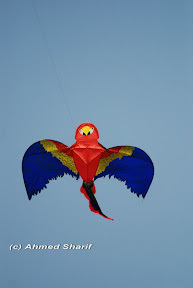 The parrot-shaped kite was flying well. 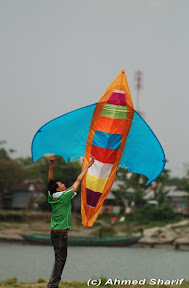 But the airplane-shaped kite proved to be too heavy for its size. It dived several times and ultimately broke. The creators didn’t give up; they repaired it and took it to air soon. 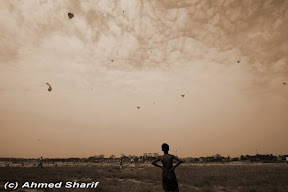 It was difficult to describe so many types of kites. The angelfish was among the recognizable few. Others were shaped like butterflies, birds, rockets, etc. Whatever their shapes and sizes, and whatever the technicalities, there was something childish about the whole affair. These little machines took us to our little years for the day. We forgot to count time. The sun was already on the western side of the sky. And we were yet to have our lunch. The organizers brought lunch from the other bank and it took some time. The lunch wasn’t the most satisfying for me, but some others didn’t hate it much. At least it filled the stomach for a while. During the lunching hours, quite a few kites (the birds named kites) showed up to compete against the bunch of crows. They swooped on any available food as if like catching prey. 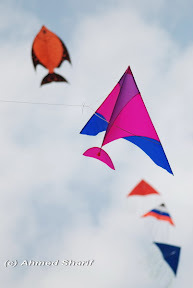 The kites filled the place with their high-pitched sound; almost like showing their presence against the man-made objects bearing their name. The afternoon session wasn’t too bright unfortunately. The wind dropped. 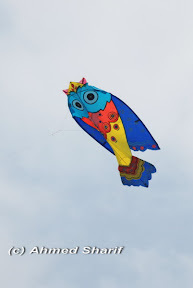 It became difficult to fly kites that needed a bit of air. The beautiful mermaid was up during lunchtime. She clearly showed what graceful flight meant. But her competition began to wane. 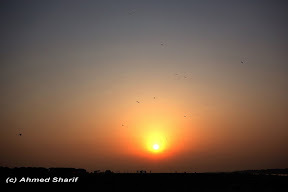 The morning session saw more than two dozens kites filling up the sky; whereas the afternoon session struggled to find even half of that. The disappointment in the sky didn’t bring down our enthusiasm for enjoyment though. We (me and my other half) took the riverbank. This is a real rural setting. Paddy fields, boats, farmers; this is what I long for during the busy weekdays. Here’s enough refreshment for a whole week. The bank had no end. Quite a long island this one. We walked for quite a while. The bank was sometimes covered by algae; sometimes it was covered by cane-mats basking in the sun. The late afternoon sun provided the pleasant light for a long walk. We could see the kites flying from a distance. The kites came down one by one. The sun followed too. 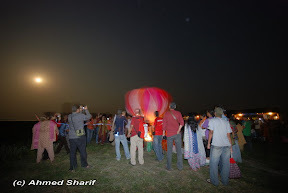 But the event was not finished without a spectacular evening show; the show called “Fanush”. This is no other than flying balloons filled with fume. The moon was up. It was a night of full moon. 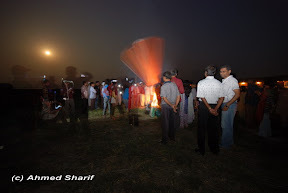 They created fire, not to compete with moonlight, but to fill up the “Fanush” (ballons). The balloons came up and were put on top of the raging fire. The first balloon took some time before they got filled. But it was discovered that the balloon had some leakage, which prevented it from taking off. It was replaced by a second Fanush. That too, showed the same flaw. Thanks God there was a third one! This one didn’t disappoint. It took off, along with the fireplace at its bottom. There was a huge cheer! Claps all around! We saw it flying way over, crossing the canal, on towards the mainland. We started off towards the riverbank after seeing the success of the last Fanush. Others remained there to play a bit more around the fireplace. But we thought a quicker getaway to the other side was a better idea than spending too much time here. We took our steps under the brightly-lit night sky. We boarded the same boat and made the same journey, but this time enjoying the reflection of the moon on the water. The journey was no longer than the one made in the morning though. We took our seats in the waiting buses. The journey back didn’t start before it was 8:15PM. The organizers took some time boarding with all their things. The warm day’s effects continued during the night too. The wind didn’t hit our faces before the bus sped up. We put out the lights in the bus. The moon did the rest. The surrounding land was lit up by the full moon. It was not dark even though the lights were out. We were all tired, but couldn’t miss the moonlight. The journey back was a journey enjoyed. It was a perfect conclusion to a great tour. Hey, do you know when's the next ghuri utshob and who organises it? I really wanna go. Awaiting your reply.